Saturday we went to town to take care of some business. We broke for lunch and had just placed our order when the phone rang. It was our daughter Rosa who told us that someone had knocked on the door with the news that our donkeys were walking down the road. The only good news that I heard was that nobody had been killed by a car....yet, and that the llama had for some reason not accompanied his good buddies. At times he seems to ignore them and browse. That's a good thing because it's tough to get him corralled again. I asked her if she thought she could get a rope on a couple of them and tie them to a tree. Doing so, even with just one or two would serve as an anchor for the whole herd. She said she thought she could so we decided to finish lunch before heading home. Mind you, this is the girl who always protests that she doesn’t like animals. Somehow she always winds up stuck taking care of them and always does very well. We gave her a call when we headed home and she had taken care of most of the problem. Four of them were locked up at home. This is a picture of that self same daughter looking like the cat that swallowed the canary with three of the four donkeys in the background. She had put ropes on two of them and and enticed them with chicken feed. Two more followed looking for handouts. Note the chicken feed on the ground. Those donkeys are real suckers for food and you can see they are not malnourished. Rosa wasn’t still standing there resting on her laurels, however. She was tending to duty holding the last of the 5 in check. That is certainly more than I ever hoped for and I can't help reflecting how I had no help when I first moved out here. With Rosa and Kelly I can no longer say that. That's actually been true for some time. Our holdout was contentedly chewing on grass in the neighbors yard. Rosa was sitting in her car in the gateway blocking off his exit to the street. Now mind you he could have gone to the back if he had wanted. He didn’t. She didn’t think he would since everyone else had exited to the front. Right again. I walked up to him with a rope and hooked him up. When I started walking him to the road he told me just as plain as could be that he preferred to stay there eating grass for a while. I had to find how they escaped before the llama did so I just tied him up and left him. I had a small holding pen for the donkeys till the fence was fixed. This is the area that I suspected. I took the picture when I was working there the day before. I thought cruz admiring himself in the mirror was worth keeping. Our neighbor is selling the back half of their property. A survey means I have had to move some fence. You can (almost) see a double strand barbed wire fence inside the old one. What remains to do is to move the old fence in and tie it to the two barbed wire strands. I was afraid the donkeys might have realized that. Need not have worried. They needed a far more obvious clue than that. Monday I added a third barbed wire to the mix in this one area. That should hold things till I get the fence moved. I'm no longer in a hurry. You pretty much see how it's going to be in this picture. There are three barbed wires. The middle one hadn’t been secured when the picture was taken and it's resting on the bottom one. You see a survey stake and my iron post inside that. The third strand is just the suspenders and belt approach. Won't be needed when the job is done but I won't move it again. The barbed wire is cheap. I have found since starting to work with this that the biggest difference between cheap and expensive is that the cheap stuff is easier to manipulate. I have grown to like easy in my dotage. You might think that moving a fence 1-2 feet on a five acre plot is sort of petty. Have to, in my opinion, if I want to take the twenty feet it gave me further down. The survey stakes are hard to ignore. Another thing in the area is the spot where we buried Blue. She occupies a very special place in my memory. The ground begin to sink and it was a low spot where water collected. The tire is just there as a weight for the wood and won't stay when I'm done. Right now the wood makes a bit of an artificial mound. I will cover it with dirt when I'm done. I digress. Finding no evidence of a jail break here I proceeded to the other side of our property for a quick fence inspection. There was evidence here. This post was wrapped in fence and laying on the ground. I guess I don’t have to point out the motive. Funny thing is that they don’t seem to be even tempted by grass when there is plenty of hay. I had gone for hay Saturday morning but they must not have been happy with my offerings. I was breaking off portions of hay from a small square bale and throwing it to them. I knew I was stuck with doing that till Monday. Hate it with my allergies but the critters become restless when they don't eat. Probably they had become involved in looking for food before I discovered they needed more. I am sure they leaned through the wire to eat the neighbors grass and someone snapped the post. I have slowly been changing my usage of poles since the EPA changed the poison they use to treat lumber. The treated lumber of the past 10 years doesn't seem to withstand rot nearly so well as before. This post went in after Hurricane Ike six years ago and it's done now. I have been finding a lot of them while moving the fence but couldn't pin down the time frame a lot of them were installed. This is temporary because the whole thing gets moved as soon as the weather cools. This weird setup is because of the need for a 16 foot gate for the pipeline people. You can untie them and swing the fence back on each side. The steel pole should keep the other pole from collapsing if they lean against it. Next week they will both be steel. Sunday night I just tied the broken pole to the unbroken one and strung some barbed wire. As you can see there is now a combination of barbed wire and range fence as described above. This combination works well for donkeys, llamas, sheep, and goats (I hope). Dogs, chickens, and ducks seem to laugh at this fine engineering. If you are well versed in donkey lore you can also read the story they left behind. First donkey: Hey guys this grass tastes great. Second donkey: Hey you knocked the fence down. Third donkey: Look! The street. I may be paraphrasing but that’s pretty much the story. I'm sure they were surprised when the pole snapped. Really, so was I. It was dark and this guy was still out. He was a little bit spooky because donkeys don’t really like to travel at night. I led him to the street and he was ok. We walked down the ditch and, even though he didn’t really like it, he was still ok. Then we got to the end of the driveway. Now I don’t know about you but when it’s dark and a person is driving around an unlighted corner bad things can happen. At least that's the way we see it. After both of us almost driving into a ditch I put solar lights at the end of the drive so we could see it. Cruz saw it also and he wasn’t about to walk past that stupid light. He was outside the corner of the fence and his mom was inside giving encouragement. By tying when I could and cinching tighter when he gave me slack I managed to get him to the corner. I couldn't get him around that corner so I tied him to a large crape myrtle tree. Since I couldn't move the donkey I decided to move the light. I stuck it in the fence behind him and he still didn’t move. That was an awful lot like work. I decided to go inside and leave him to ponder the light in his rear view mirror. After about 20 minutes and a glass of water I returned. Cruz had turned the corner and he started braying when he saw me. From there it was easy to get him inside. This is what it takes to keep the peace at the Wilcox house. It came Monday morning bright and early. 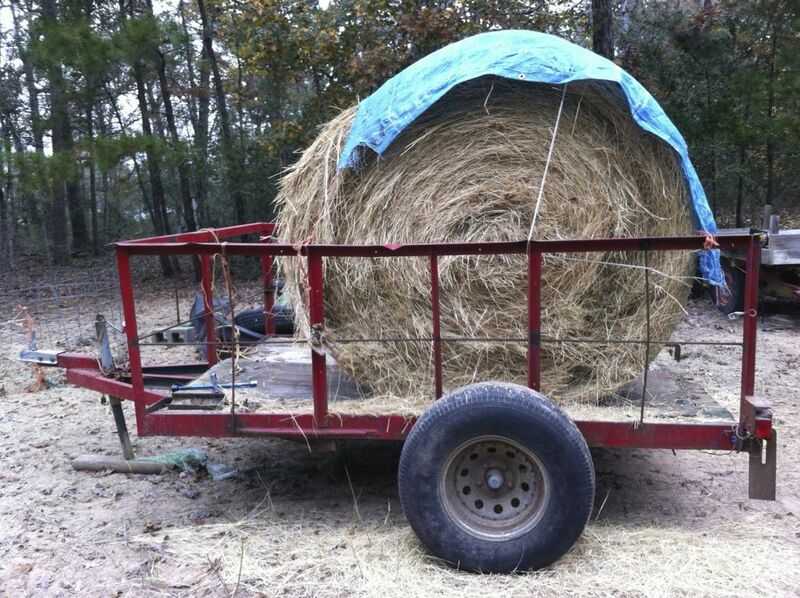 This size bale lasts about a month. The next size smaller about three weeks. 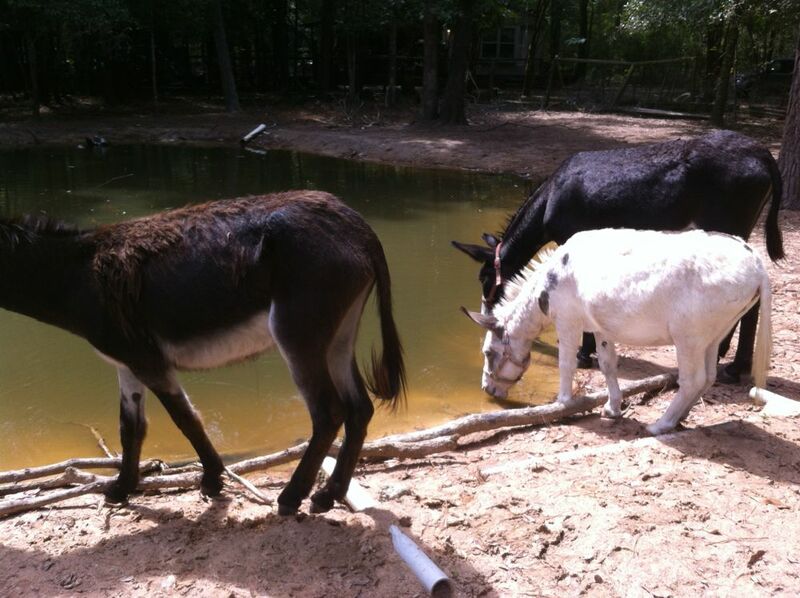 5 donkeys and one llama cost about $20-25 per week. Monday after the hay was in place I opened the gate and this was the main attraction. They had run through over 10 gallons of water in two days. The pond has allowed me to quit putting out water for them under normal circumstances. After Wednesday’s rain the pond is full again. Next experiment will probably be to buy a couple dollars worth of feeder fish to put in the pond. Too much algae but when it’s full it isn’t quite so thick. Small catfish might work also. What's cheap and likes algae. Oh well, that’s a story for another day but I'll take suggestions. You raise them and love them and they still try to leave home before a parent is ready.